All the ingredients are there for a high-quality holiday. 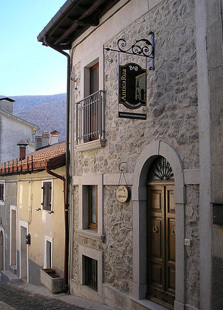 ANTICA RUA BED & BREAKFAST stands in the ancient village of Opi. Its stone façade blends perfectly in the picturesque cluster of houses lining the village surrounded by one of the most scenic landscapes of the Abruzzo National Park featuring Mt Marsicano, Mt Amaro, the Fondillo Valley, the mountain ranges of Camosciara and Mt Greco, Mt Irto, Mt Petroso and the large valley connecting Opi to Pescasseroli. This Bed & Breakfast provides self-catering accommodation in independent bedrooms with bathroom for 11 beds in total. Guests can share the kitchen and the small dining-room with TV to prepare and enjoy their own breakfast.